On Friday, Jan. 31, the University of Maine men’s ice hockey team fell to Hockey East rival University of New Hampshire (UNH) Wildcats 3-2 after forcing overtime in front of a sold out crowd in Durham, New Hampshire. The Wildcats stormed out of the gate in front of the home crowd, scoring the first goal of the contest off a breakaway from fourth-year forward Ara Nazarian. 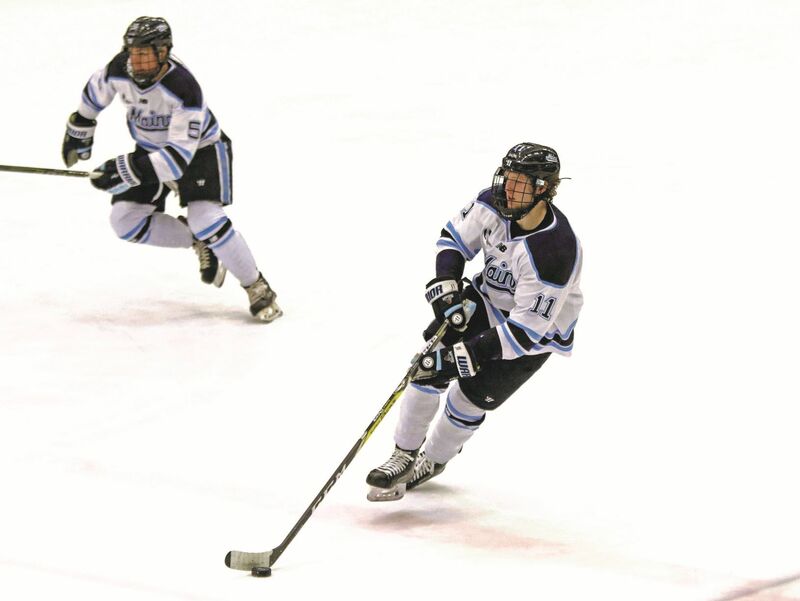 First-year forward Jackson Pierson drew the attention of the lone Maine defenseman and dished the puck off to an open Nazarian, who took the open opportunity to score. The Wildcats grabbed a 1-0 lead less than eight minutes into the game. Maine wouldn’t be defeated easily, aggressively winning the following faceoff. Maine’s top line of second-year forward Eduards Tralmaks, third-year forward Chase Pearson and third-year forward Mitchell Fossier came down on the attack and fired four close range shots on Wildcats’ second-year goaltender Mike Robinson, but they could not bury the puck. After the first period, Maine outshot UNH 12-9 and the Wildcats went 0-1 on the power play. The second period started with the Black Bears coming out strong with a couple of quick opportunities in New Hampshire’s zone, but were unable to penetrate the crease. Five minutes into the second period, Wildcats’ second-year forward Charlie Kelleher got the puck from Nazarian in the slot and sent a wrist shot to the upper glove side of the net to put the Wildcats up 2-0. After the second period, UNH tallied 14 shots on goal while Maine had seven. The Black Bears went 0-1 on the power play while the Wildcats went 0-2. Going into the third period UNH had all the momentum and the crowd to back them up. Five minutes into the period, fourth-year forward Brendan Robbins had a breakaway for the Black Bears but was met by Robinson, sliding to the lower glove side of the net to make the one-on-one save to keep the score 2-0. Second-year forward Emil Westerlund scored Maine’s first goal of the game when he found the back of the net with eight minutes to go in the third period. Second-year defenseman Brady Keeper found the wide open Westerlund streaking in from the far sided face-off circle. First-year forward Jakub Sirota also assisted on the Westerlund goal. To match the score, Pearson scooped up the loose puck after a shot from fourth-year defenseman Sam Becker cranked it from the blue line. Maine’s captain fought his way to the front of the net to try and disrupt New Hampshire’s defense, scooping up the loose puck. Able to get his stick on the shot, Pearson tipped the puck past the Wildcats’ goaltender to send the game to overtime. One minute into the overtime period, Nazarian fired the puck through traffic off the faceoff, and Nazarian’s shot found its way into the Maine net. Despite the late comeback, the Black Bears were defeated by the Wildcats, 3-2. The Black Bears’ outshot New Hampshire 39-34 while second-year goaltender Jeremy Swayman made 36 saves. On Saturday, coming off of a close defeat, Maine came into the contest looking for revenge. With nine minutes to go in the first period, third-year forward Tim Doherty scored Maine’s first goal of the night when he cleaned up a rebound and took advantage of a wide open net. First-year forward Jacob Schmidt-Svejstrup corralled the puck behind the Wildcats’ net, and attempted to wrap the puck around the cage, but New Hampshire’s Robinson made the stop on the initial shot. Doherty, crashing the net, picked up the rebound and gave the Black Bears an early 1-0 lead. The Wildcats were called for a penalty on the Maine scoring play, and the Black Bears went on the power play after the tally. Fossier, as Doherty did earlier, scooped up the loose puck off of a deflection and scored. Keeper worked the puck around to Tralmaks, who fired the puck on net. Fossier jammed home the loose puck, giving Maine their second goal of the first period. Wildcats’ second year defenseman Benton Maass struck back for New Hampshire, wiring a shot from the blue line that found its way into the Maine net for UNH’s first goal of the evening with just four minute to go in the opening frame. With traffic in front of Swayman, the goaltender from Alaska was unable to see Maass’ shot. After winning the following faceoff, New Hampshire tied the game 2-2, when one of Maine’s defensemen fell behind their net, giving the Wildcats an odd man rush. Nazarian received a pass from fourth-year defenseman Richard Boyd as he was crashing the net from the face-off circle. Nararian buried the puck and tied the game for his squad. The second period started out with back and forth play, as both goaltenders were on stalwarts. With two minutes left in the period the Black Bears were on a powerplay, when Fossier collected the puck in the corner and dished off a nice between the leg pass to third-year defenseman Alexis Binner, who then collected it and passed it across to Keeper. Keeper snagged the puck and fired it top shelf to put the Black Bears up 3-2 going into the second intermission. The Wildcats outshot Maine 26-19 through two periods. Heading into the third period, Maine kept its foot on the gas, scoring three minutes into the period. After a lengthy review, Pearson’s third period goal was upheld by the referees. The captain deflected the puck off his skate and into the open net, after Tralmaks fed the puck to Fossier, who dished it off to Pearson. Maine grabbed a two goal lead early in third. With under two minutes left in the game, second-year defenseman Max Gildon put the Wildcats within one goal when he buried a wrist shot into the upper glove side after receiving a pass off the face-off from fourth-year forward Marcus Vela. A minute later, Fossier scored an empty-netter for the Black Bears to make the final score 5-3. Swayman made 39 saves helping the Black Bears improve to 6-7-3 in Hockey East. Maine will return to the ice when they host conference rival Providence. Game one of the series is scheduled for Friday, Feb. 8 with a 7:00 p.m puck drop.